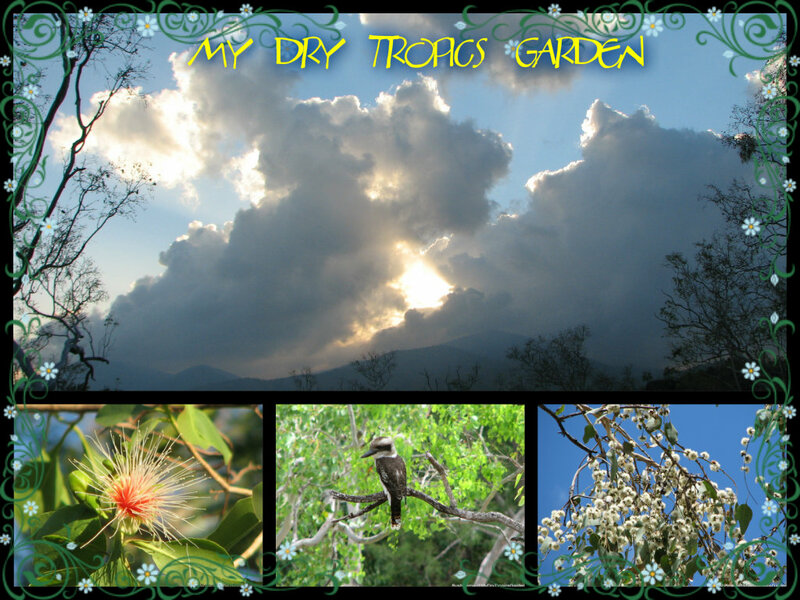 My Dry Tropics Garden: The Harsh End Of The 2015 Dry Season ... My Dry Tropics Garden Journal ... Week 40, 2015. Video Diaries of My Garden. Come and take a wander around my dry tropics garden here in north-eastern Australia. The Harsh End Of The 2015 Dry Season ... My Dry Tropics Garden Journal ... Week 40, 2015. September is officially our first month of Spring. Whilst so many gardeners around Australia are rejoicing and getting back out to enjoy their gardens, the reverse is the case for me in my particular corner of this wonderful country. The enjoyable part of my gardening year is now well and truly over. Spring comes towards the latter half of our long dry season, and this year's dry season has been particularly harsh at my place. Yes folks, that's my front yard. It's bone dry and the 'grass' (in truth, the weed patch) is an attractive shade of dead. Our dry season is now in full swing and it's been exacerbated by the failed wet season at the beginning of the year. Usually we average somewhere around 770 mm of rain over the first three months of the year - which are our last two months of Summer and first month of Autumn. The first three months of 2015 saw an underwhelming total of just 220 mm. That amounts to a failed wet season. The start of our dry is usually April and it can last anything up to nine months. This year's dry season has seen around 33 mm of rain fall. Yes, that's what I said ... there's been around 33 mm of rain since the end of April. For those who work in inches when it comes to rainfall - 33 millimetres is just over 1 inch of rain, 1.2 I think! So over a period of five and a half months we've had very little rain. We usually average around 82 mm / just over 3 inches between the start of April and end of September. So, I guess the picture is becoming clearer. It's been a dry 'ole year so far, really dry! The trees in the surrounding bushland look after themselves by dropping most of their leaf load, which quickly dries up and becomes a carpet of crunchy crispy brown bits. That native grasses and groundcovers just die off, and the soil becomes rock hard very quickly. The blustery winds we often get at this time of the year also causes the ground to dry out completely. That's fine for the bushland as it will recover quite quickly when the wet season rains finally arrive. It's a different scenario for my garden though. During most dry seasons the plants drop their leaf load or die back a little, but this year there has been more of the dying off! The plants in the various garden beds have been very thirsty for a very long time now. I've had a few losses this year and they won't be bouncing back. I've lost a couple of my Mussaendas and Acalyphas, which are usually quite tough plants. A lot of the taller trees and shrubs drop their leaf load in the dry which creates a layer of mulch throughout the garden. Usually that's helpful in keeping some level of moisture in the soil. But without the total soaking the garden gets in a regular wet season, there's been almost no moisture in the soil whatsoever, so the mulch of lost leaves hasn't really been all that helpful. I water sparingly in most of the garden beds, about every three to four weeks. We don't have a bore and our excess water fees are astronomical in these really dry years. I do however put on sprinklers in the early morning or evening for a little while every few days out in the newly established garden beds. These were only just completed last year, and I've had to work hard to keep the plants going this year. I'm really hoping that all these plants will get through the tough times and onto the next wet season, as I would love to see these beds flourish. Fingers crossed for a decent wet season in early 2016. I would love to plant more and really fill out these beds. The lack of rain this year has also caused another issue. This dry season I've also had a really, really bad problem with a small group of Agile Wallabies that have been visiting my place. They are obviously hungry and searching for food, but this little band has decided to treat my garden plants as their daily feed. Now in previous years I've always been on their side, but my point of view has changed a little. I've never before witnessed this level of destruction caused by these wallabies in all the years I've lived on this property. Sure, after Cyclone Yasi they did feast on a couple of plants they've never touched before. The gorgeous six-foot high Hibiscus shrub in the front garden bed suddenly became their regular treat. It's never recovered since as they still keep munching on it. But suddenly in the last few weeks the wallabies have gone beserk! They have literally stripped back almost every cane of every Russelia clump on the property. There are quite a few clumps - around fifteen huge ones. The wallabies have nibbled on a few canes before, but now almost every cane is a stump! The once lush-looking, always-flowering clumps are now looking very tattered and torn. The wallabies have also stripped back so many of my Hibiscus rosa-sinensis 'Snowflake' and 'Roseflake' bushes, that they now look like sticks poking out of the ground. They're a dreadful sight. The front garden bed has been completely trampled and stripped. That sorry looking clump used to be the six-foot high Hibiscus shrub I mentioned previously. The garden bed itself was quite lovely with the several Hibiscus shrubs surrounded by always-blooming clumps of Russelia. I've had to get in and trim back almost every plant in that front garden bed in an effort to save the poor things. It all looks quite dreadful. In the rock garden, the wallabies trampled down the dying-back clumps of Pennisetum as they got close to the Hibiscus shrubs behind and started stripping the leaves off the lower parts of the shrubs. I've cut down the Pennisetum and tidied up all the broken branches of the Hibiscus and Acalypha shrubs. The rock garden bed is not looking good. Other sections of the driveway garden beds are looking less than lovely, as the wallabies have feasted on the leaves of so many of the little shrubs trying to establish themselves. Now while the death and destruction out in the garden beds is certainly unsettling, the destruction that has occurred in my courtyard garden is quite simply heart-breaking. Those of you who have followed my posts for a while now, will know just how much I love my courtyard garden. It's been my haven for several year and I've put a lot of effort into having lots of lovely potted colour all around the courtyard. This was the courtyard garden about three weeks ago. Not too shabby, even though I didn't have as many potted annuals as usual for this time of the year. There was an endless parade of birds coming in to drink the nectar of the flowers. There were loads of bees buzzing around doing their thing. There were lots of lovely flowers to admire as I wandered around in the morning with my cuppa. Well, things have changed considerably in a short period of time. This is the view out onto the courtyard this morning! I've had to pop many of the potted plants up onto the table and then set up a barricade in an effort to stop the feasting. There's not much left around the courtyard to admire while strolling with a cuppa in hand! It just feels barren and bare to me. There's no joy to be found out there at the moment. This is one of the main culprits, caught in the act about a week and a half ago, stipping off most of the leaves on the Cordyline plant. We attempted to scare her off with lots of noise and yelling, but she would just stand her ground and wander off when she felt like it! Can you see the missing plant in the bottom shot? Yes, the wallabies really love Costus plants. Firstly, they stripped the stems of their leaves, then starting pulling out the stems! I was getting crankier and crankier watching the destruction. Luckily, most of the plants, such as this Begonia, will recover and grow back as it was just the leaves and flowers that were eaten. But sometimes, the wallabies would knock over the pot in an attempt to get the roots as well. This is what happened to my favourite Anthurium. I've tried to save parts of it, but will have to wait and see if it recovers. My favourite Caladium was also knocked over. They weren't content with just eating the leaves. They had to get the bulbs as well. I've got my fingers crossed that the bits I saved will bounce back and I'll see these beautiful leaves once again. I've now got a little plant hospital out in the courtyard now! These are the things that are expected to make a full recovery. 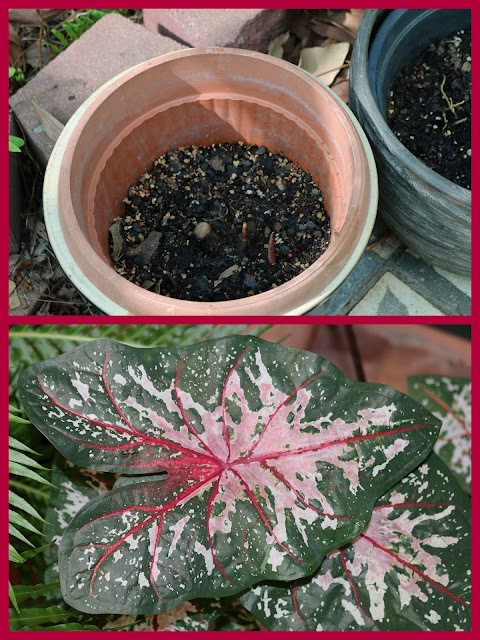 The Anthurium and Caladium are in intensive care out in my shadehouse garden, along with a couple of other plants in dire straits. Thankfully, my shadehouse garden has not been touched. The wallabies have not yet found a way into that space. I'm still able to enjoy some lovely colour out there. So there you have it. It's been a while since I last posted a garden journal post and this one has been a tale of woe. Yes, I know that a lot of the plants will recover. Yes, I know the courtyard garden will reign supreme once more. Yes, I know the wallabies need to survive this long, long dry as well ... but for now I'm just wallowing a little and feeling a little down. Dry seasons are harsh on my garden, but it seems this year is going to be particularly testing. Let's hope everything just hangs in there until the wet season arrives. Hopefully that's only about four months away now. It's all horses for courses, Margaret. Your problems are just as heartbreaking as mine. I know there will be rain, but the waiting is going to be excruciating. Oh my word. I will never complain about the elements again!. Thank goodness you have your lovely shade house for solace, I hope things turn around soon.I will put a link to your blog on my website, and share this around. Pauline, I should be used to gardening in the dry tropics by now, but some years are just harder than others. In saying that however, we've had worse. We've had a few years of drought before, but my memory dims as the years pass. I know the rain will eventually come, but the waiting is hard sometimes. In the time I've been following your blog, this would have to be the worst year. We had a huge drought not long after we started our garden at Karalee and went into survival mode for a couple of years. As you say, most plants do recover, but it's an agonising wait. Let's hope this year's Wet comes early. Thanks Missy. I have to say this has been the worst gardening year for me for quite some time. I can remember a particularly long dry season back when we first moved here, but at that stage I didn't really have much time for gardening. The garden definitely went into survival mode back then and we lost a few plants. The predictions so far are not all that favourable for an early wet season. I just want a decent wet season and late is much better than never, lol! Thanks for sharing your situation with all of us. I will try to remember this post when the weather and the critters are doing bad things to my garden. We all have our crosses to bear when it comes to gardening, John. There's always some negative no matter where you might garden, and yet we carry on. We are at heart the most optimistic people arent' we? Oh Bernie, this is terrible. I can wholeheartedly sympathise with the wallabies as we have deer and they have the potential to be just as destructive. So far they have stuck to the periphery of the garden but they are getting braver. They leap high fences and even if I had the money to do it, why would I want to live in a prison yard? I do hope the rains come soon this year. I guess a lot depends on how El Nino develops. Thanks Rusty Duck. These things do go in cycles and we haven't had such a dry year in a while. We are now officially in an El Nino period and that means the predictions for the coming wet season are really not all that favourable, but I'm holding on to the hope that there will be some decent rain. Only about four months to go!! How big are they? Looks as if they might have a substantial appetite. Tantalising to battle to get the new beds to fill in. Diana, they're considered a medium-sized wallaby. The males grow to a length of around 85 cms and weigh anything up to 27 kg, while the females are smaller, reaching around 72 cms and weighing up to 15 kg. Usually they dine on grass and leaves, but when our long dry seasons hit they become opportunistic feeders and will munch through almost any plant. I've given up on planting anything else in the new garden beds for now. I'm waiting to see if a wet season arrives next year. I'm fairly certain that's a boy, and an Eastern Grey Kangaroo. I used to always call mine Wallaby's too, until someone quizzed me on it - so I did some research and realised Wallaby's are completely different. There are also Wallaroo's, which I never knew about before - a cross between a Wallaby and Kangaroo. And they're all ferocious on gardens when there's no feed in the bush. That's why I plant a lot of pigeon peas around the place. Its my tithe and respite when the rainstorms don't come, week after week. They really love this particular plant, so my recommendation is to get some seeds and plant them around (once the rains arrive of course). They can self seed if you get a thicket going. These are tough plants, designed to survive extremes and it helps the Kangaroos out. I hate seeing them without food, because our backyard has become somewhat of an accidental nursery. All the mothers bring there babies here, and I hate seeing the poor buggers skinny from lack of food. I dare say, quite a few females have probably miscarried to survive the drought your way - as happens, in bad years. Thanks Chris. We had started thinking about throwing pellets out for the marauders. Apparently you can get wallaby food now. I think perhaps pigeon peas might be a better alternative though. I'm not keen on buying loads of wallaby food in a bag. Have never tried growing pigeon peas but it's a thought when the rain does come, although we've worked hard at clearing out all exotics from our bush paddock and wouldn't like pigeon pea plants to start taking over either. No rain expected for some months yet, so I've just got to try and put up with the wallaby feasting in the meantime. Oh dear Bernie ~ What a time you and your gardens and even the poor starving critters are having. I hope you get much needed rain during your upcoming 'wet' season. May the marauding critters move on to greener pastures. Yes the shade garden is my haven right now, Lorraine. 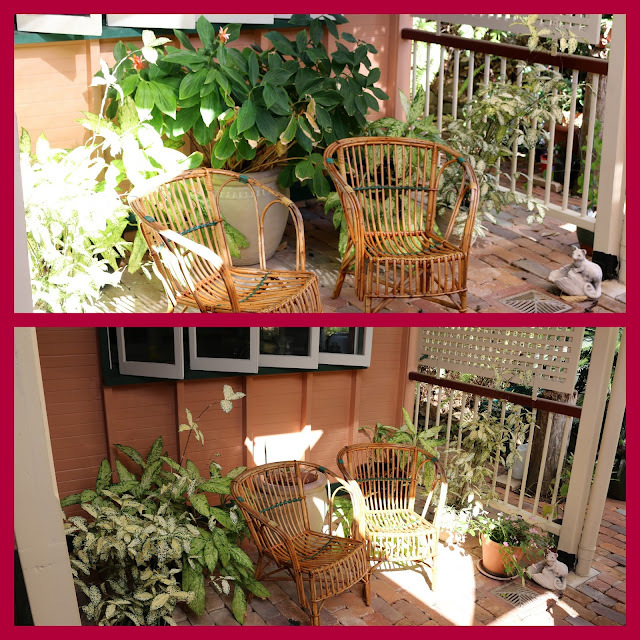 Thank goodness it remains intact with some lovely plants providing great colour and foliage. I know rain will come eventually, but I think the wait is going to be a long one! Hi Bernie, my name is Annette.I've recently moved back to Bowen..I've been lucky enough to move into a home where I'm aloud to work on the gardens..... Not that there is any grass or gardens left.I happened across your blog,while searching for best places to put a greenhouse. Perhaps you could help me,please.? Full sun or shade? under poinciana trees,that cover the front and back yard?or side of house,unprotected from the fierce winds we get. Any feedback would be really helpful and appreciated. Hi Annette. I'm a born and bred Bowen girl myself, so I know the dry and windy conditions you will be getting down there. First of all, I'll answer your question about the shadehouse by describing where mine is. Mine runs down the entire western side of my house but it is banked completely on one side by a rock wall which you cannot see in the photos because of the ferns. The rock wall acts as a wall obviously and helps create a very sheltered spot where the high gusty winds we get here can not enter. When there's a gale blowing around everywhere else, the plants in the shadehouse barely move a leaf. 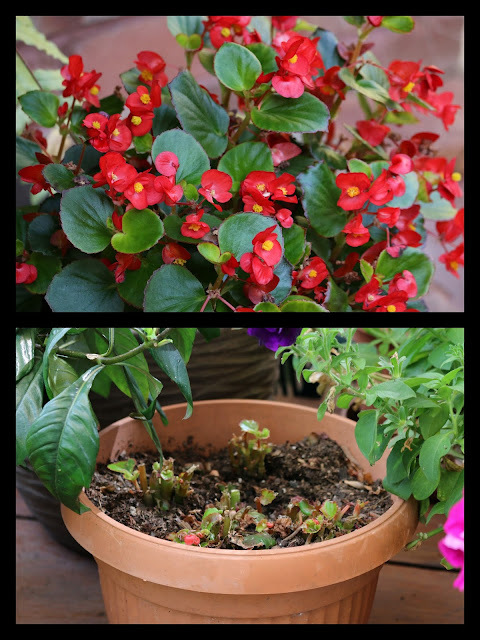 That's why I can grow so many of the more tender plants like Ferns, Impatiens and Begonias. They would never survive out in the garden beds here. I would definitely try and place the shadehouse in a more sheltered position so that the winds don't dry out the potted plants you're going to be growing in there. Otherwise you're going to be watering constantly. The only problem with placing a shadehouse underneath Poincianas is obviously the amount of mess they drop - the leaves, the seedpods and sometimes the branches. We both know just how messy these trees can be. If you put your shadehouse directly under a Poinciana, the chances are mess will build up on the roof of the shadehouse very quickly and become quite a heavy load for the roof. If the roof is also shadecloth, then it will start tearing and ripping apart rather quickly. You might need to consider a more substantial type of roof over the shadehouse. Well, that was rather a lengthy answer, lol! Hope it's helpful. I'd love to hear how things go. Sue, you got to see our dry tropics area in the middle of a proper dry season. You're most welcome to link to my post. Next time you're up this way, make sure you do get in contact so we can catch up. That would be lovely. I appreciate your comments and will endeavour to reply to all. All comments are moderated, so spam will be fried. Visit Bushbernie's profile on Pinterest. I garden in a dry tropics zone in north eastern Australia. Conditions here are comparable to U.S. Plant Hardiness Zone 11. My region's weather pattern is dominated by a short wet summer (around 3 months) and a relatively long dry season for the remainder of the year (around 9 months). The Heat Zone here is 9, which means we average at least 180 days with temperatures above 30 deg C (86 F). The Cold Zone here is 11, which means our absolute minimum temp. is 4 deg C, but that rarely happens. We can sometimes experience winter night-time lows of around 8-10 deg C (46-50 F). Temps. usually range between a winter minimum of 13 deg C (55 F) and a summer maximum of 35 deg C (95F). We average at least 300 clear days of sunshine each year. Hibiscus rosa-sinensis variegata "Roseflake" and "Snowflake"
Two of my favourite local native north Australian winter flowering trees. Wife, Mother, Grandmother, Teacher and just your regular variety of home gardener. I have no horticultural degree or landscape business. I am not a garden guru who can offer great advice, or indeed a writer who can share a wealth of knowledge about plants or gardening practices. My passion for gardening only really began about four years ago and there's nothing I like better than wandering around the garden after a day's work. 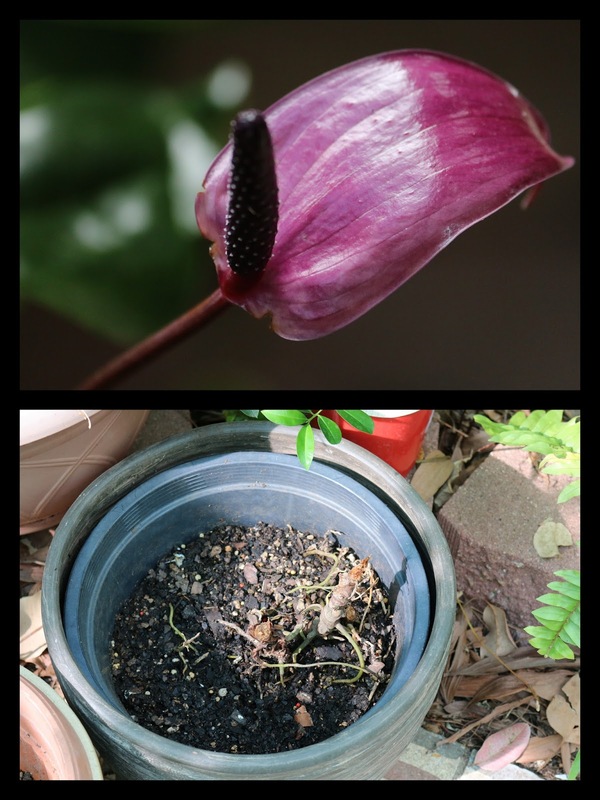 I started this blog as a fun way of recording what goes on in my dry tropics garden here amongst the bushland of north-eastern Australia. All of the happenings at Wall Flower Studio - Redecorating, collaborating, engaging and more! bernieh's latest photos on Grows on You, where garden ideas are shared.